The cottage is in a little hamlet of half a dozen homes set around the 18 th century Acton Castle . 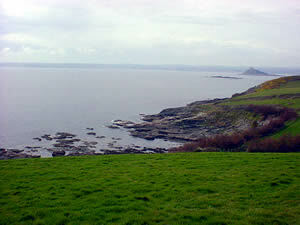 There are stunning views across meadows to the sea. It takes five minutes to walk down to the South West coast path from where there is another tiny track leading to Stackhouse, a rocky cove with some sand and shingle, caves in the cliff and many rock pools to explore as the tide goes out. 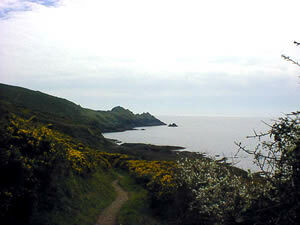 There are several other small coves within a few minutes walk, some more easily accessible than others, but all of them quiet and peaceful as public access involves a long walk. Our cove is visited by seals and, in some summers, dolphins. A half hour walk in one direction brings you to Perranuthnoe which has a larger beach with surfing. It's a pretty village with a small church overlooking the sea and a pub with a small beer garden, a children's room and a reputation for excellent food (best to book). Another half hour in the same direction and you reach Marazion with a long sandy beach, many interesting shops, welcoming pubs overlooking the sea and access to St Michael's Mount. 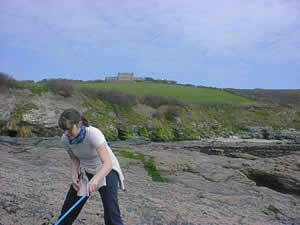 In the other direction it takes an hour to walk, past picturesque Prussia Cove, to popular Praa Sands, with a big sandy beach, surfing, pub on the beach. All of these places are just a few minutes drive away. A mile up the lane takes you to the village of Rosudgeon with a pub, a garage with small grocery shop and Post Office, a sports field and bus to Penzance in one direction, Helston and Falmouth in the other. Half a mile from Rosudgeon, at Perran Cross Roads, there is a good farm shop selling largely local produce, much of it organic, and a large Chinese restaurant with take-away. Penzance is our main shopping town with large selection of independent shops as well as supermarkets. It has a small cinema, large outdoor sea water art-deco swimming pool, leisure centre due to open summer 2005, and many pubs and restaurants. Penzance is the last railway station in the South West – trains to London and the North as well as a little train to St Ives, where you can find the Tate gallery among many others and a lively town.